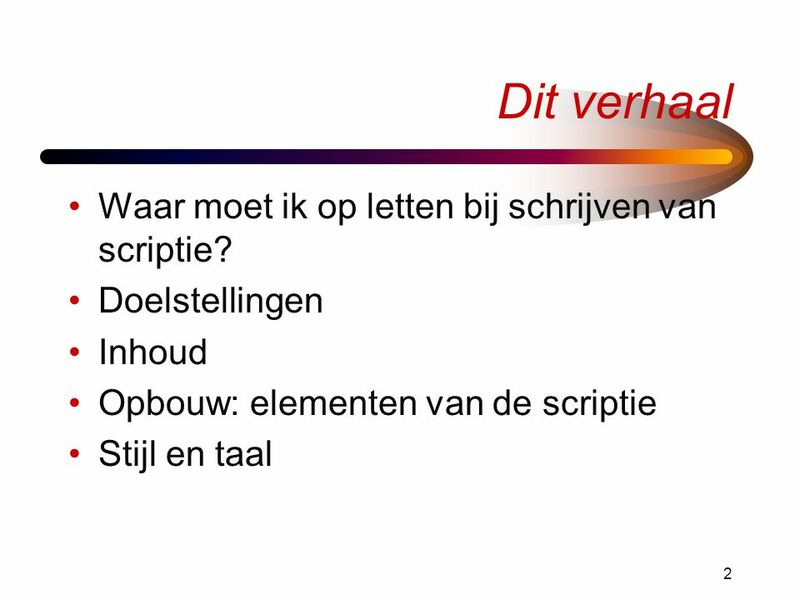 2 Dit verhaal Waar moet ik op letten bij schrijven van scriptie? 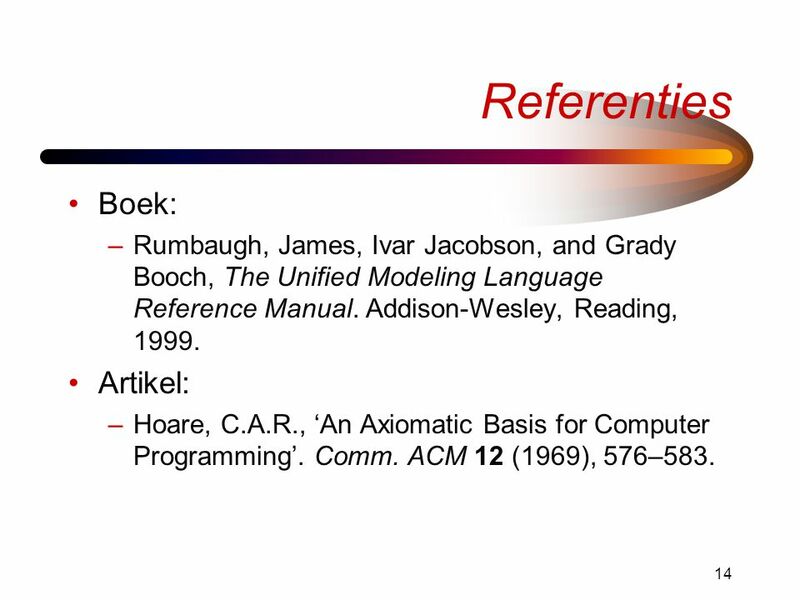 Rumbaugh, James, Ivar Jacobson, and Grady Booch, The Unified Modeling Language Reference Manual. 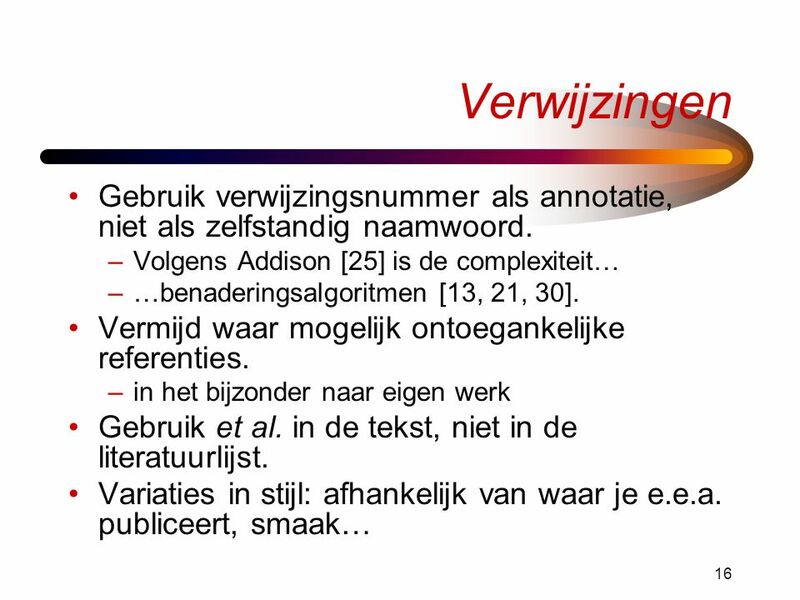 Addison-Wesley, Reading, 1999. 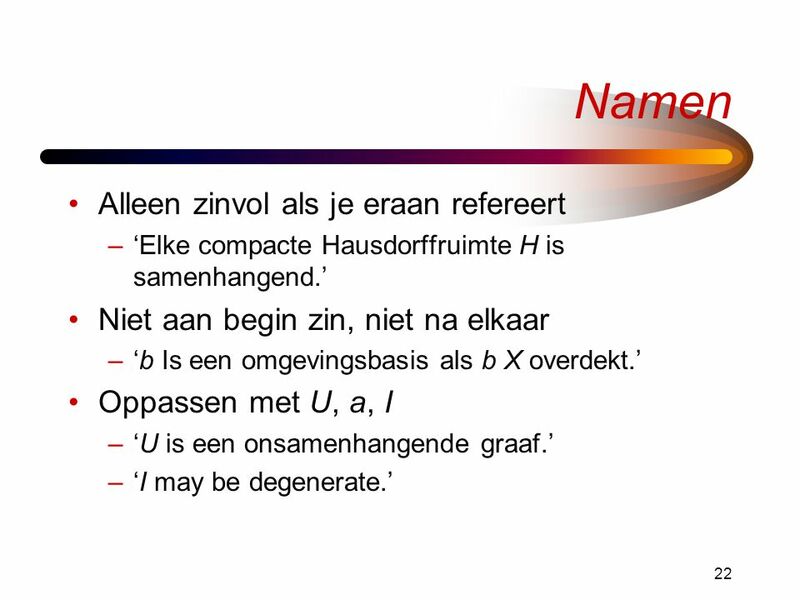 Artikel: Hoare, C.A.R., ‘An Axiomatic Basis for Computer Programming’. 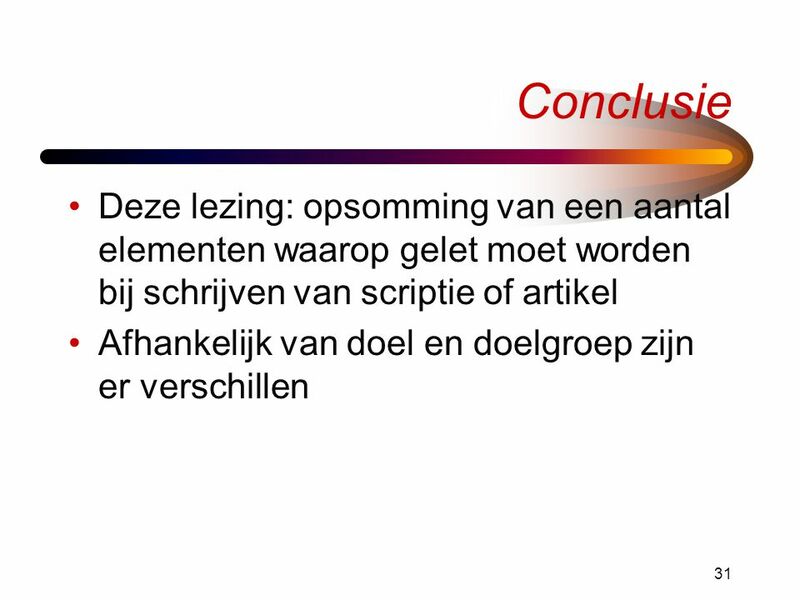 Comm. 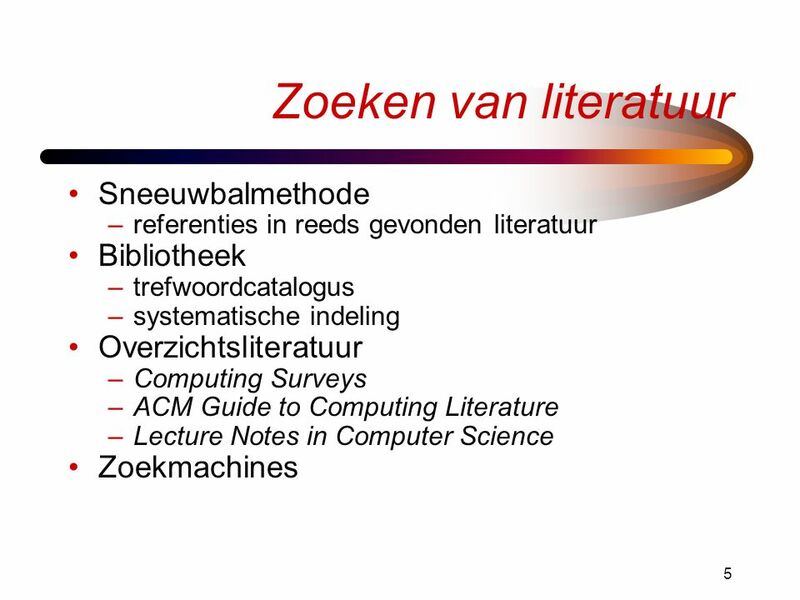 ACM 12 (1969), 576–583. 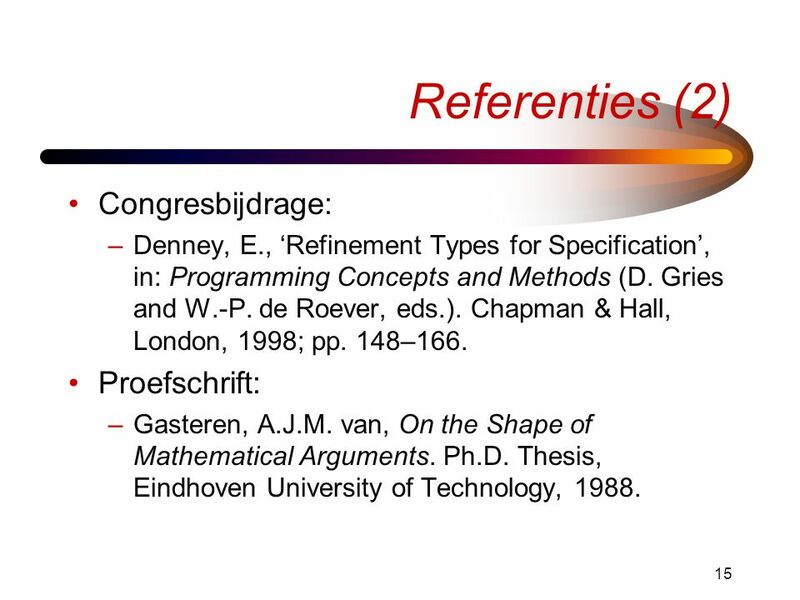 Denney, E., ‘Refinement Types for Specification’, in: Programming Concepts and Methods (D. Gries and W.-P. de Roever, eds.). 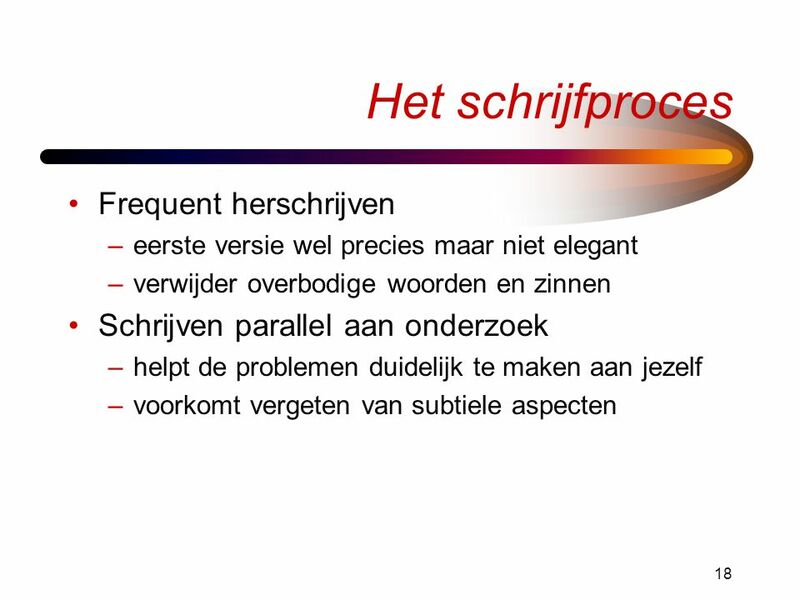 Chapman & Hall, London, 1998; pp. 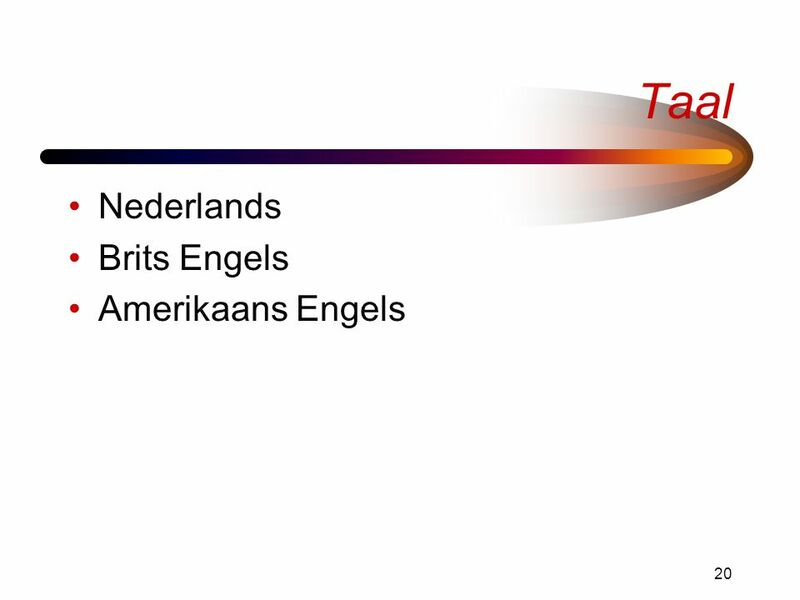 148–166. 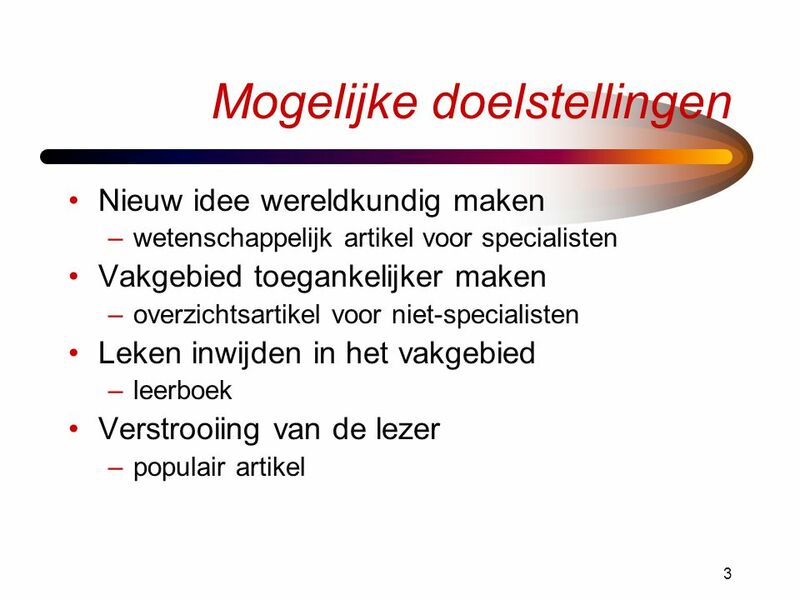 Proefschrift: Gasteren, A.J.M. 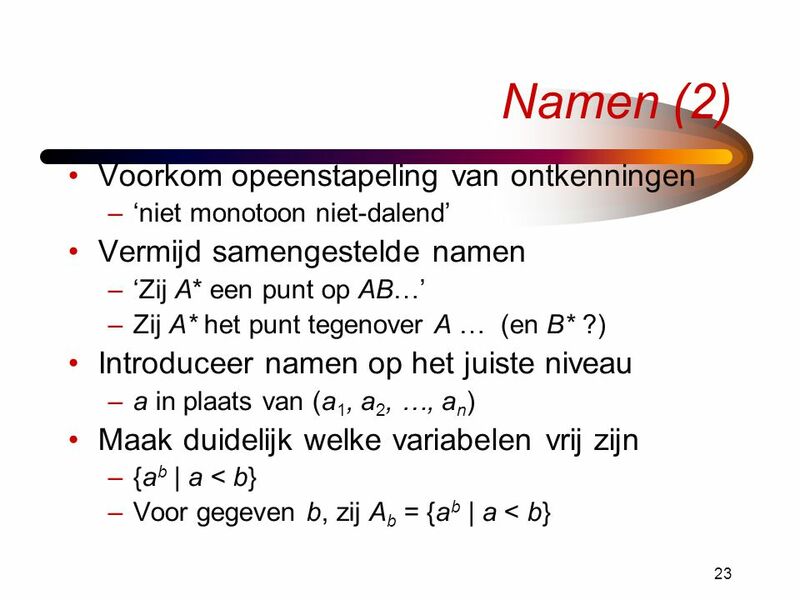 van, On the Shape of Mathematical Arguments. 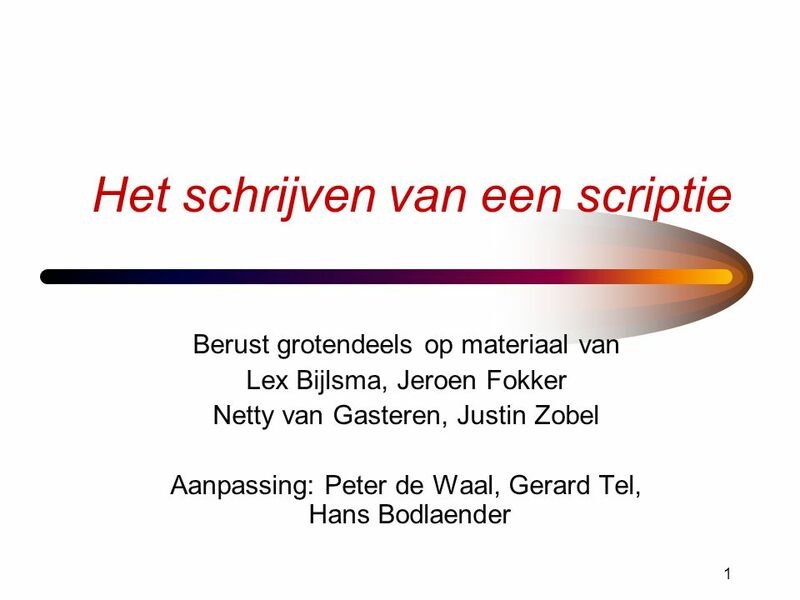 Ph.D. Thesis, Eindhoven University of Technology, 1988. 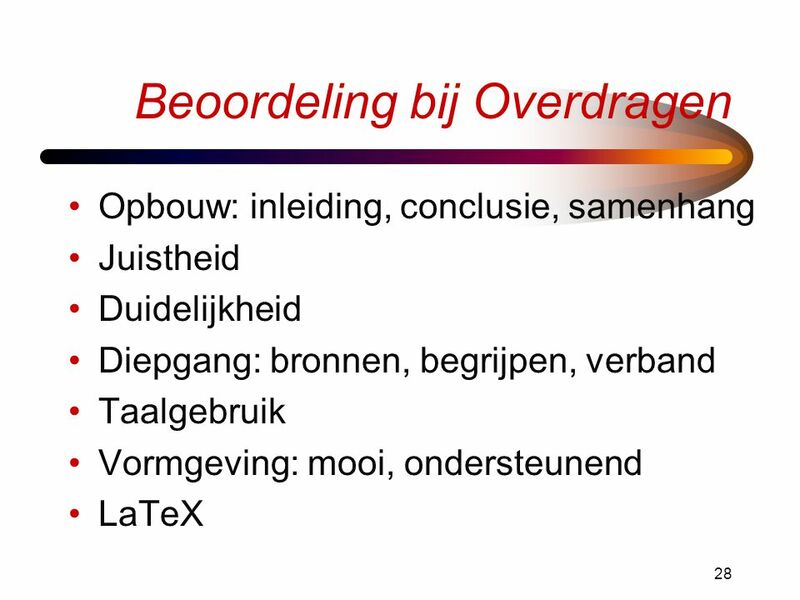 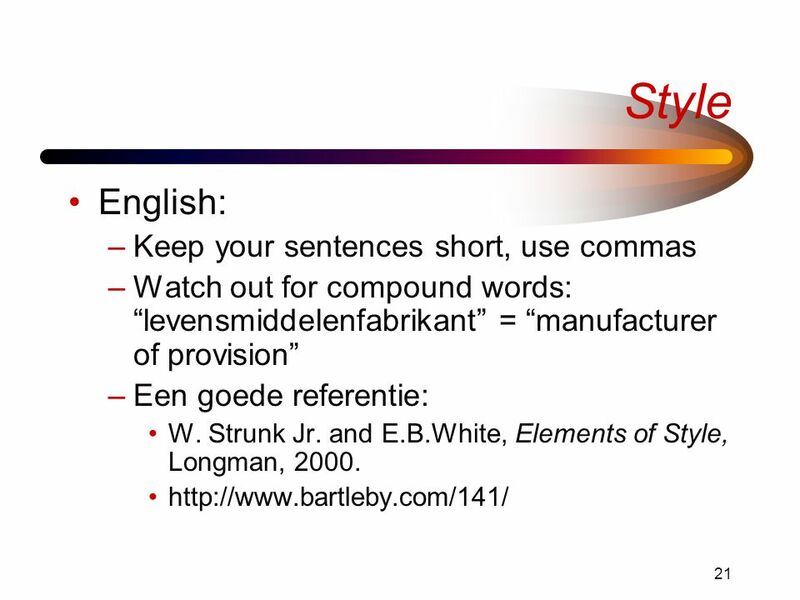 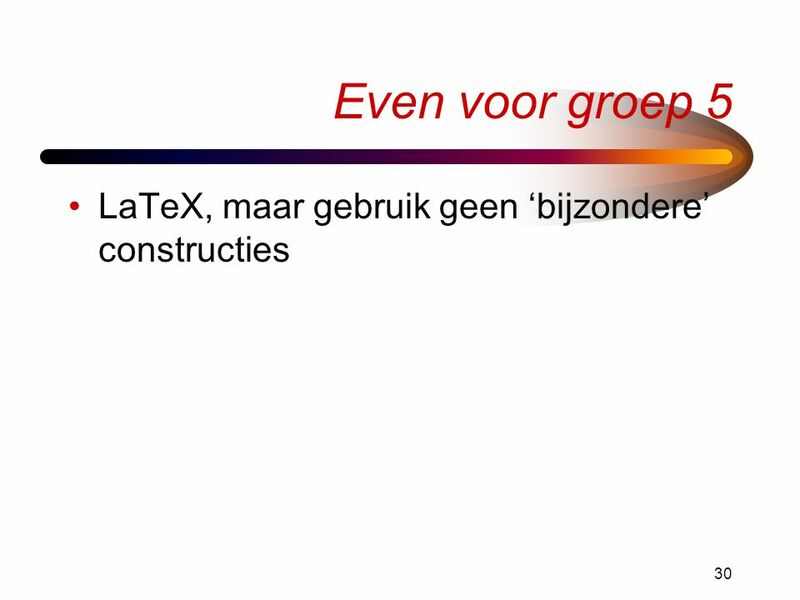 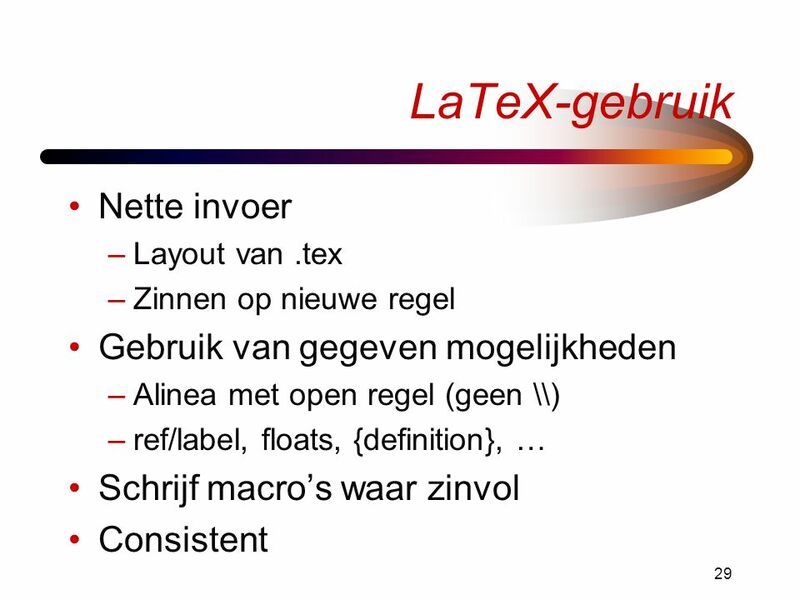 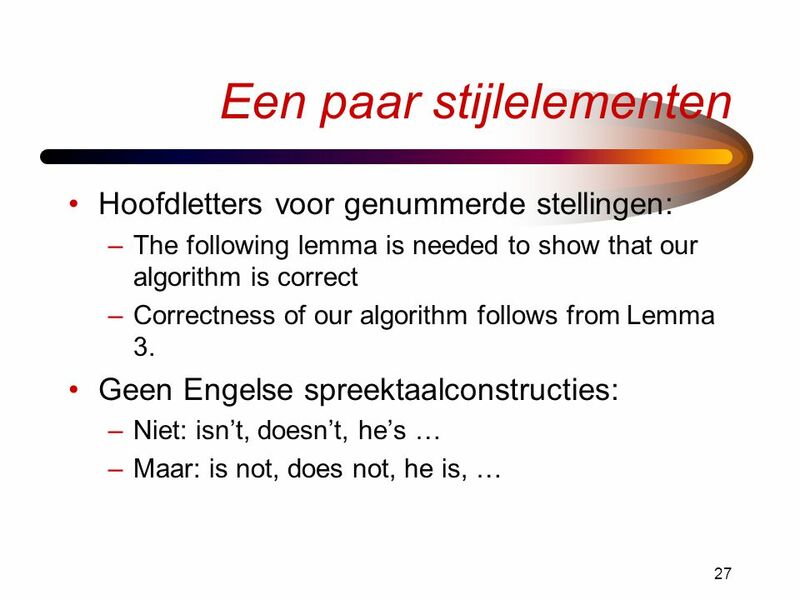 Watch out for compound words: “levensmiddelenfabrikant” = “manufacturer of provision” Een goede referentie: W. Strunk Jr. and E.B.White, Elements of Style, Longman, 2000. 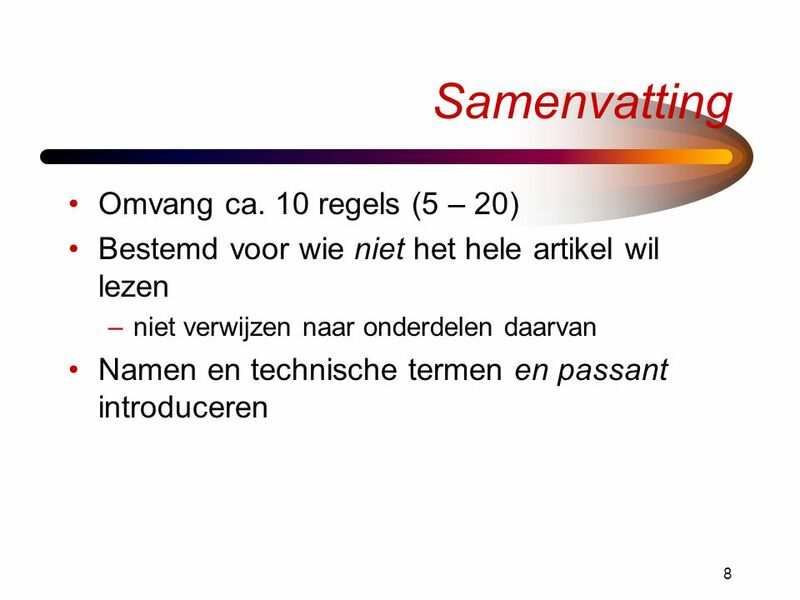 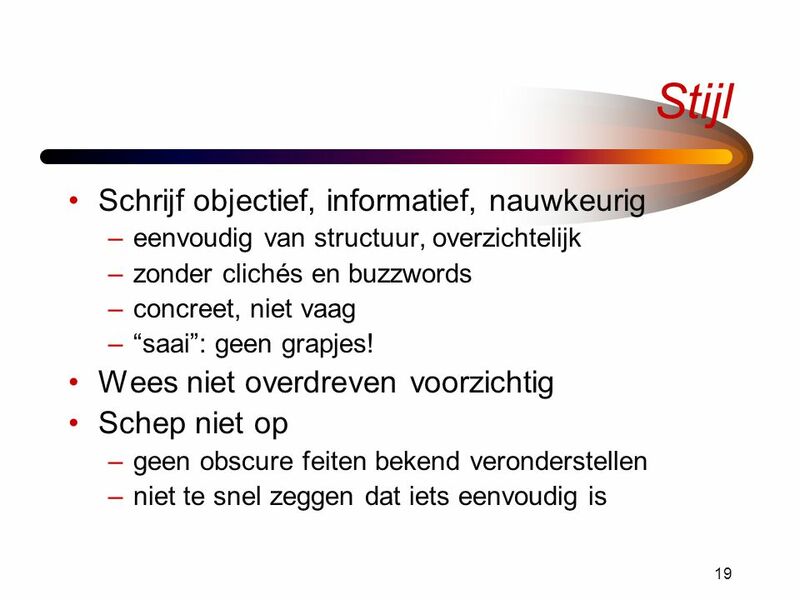 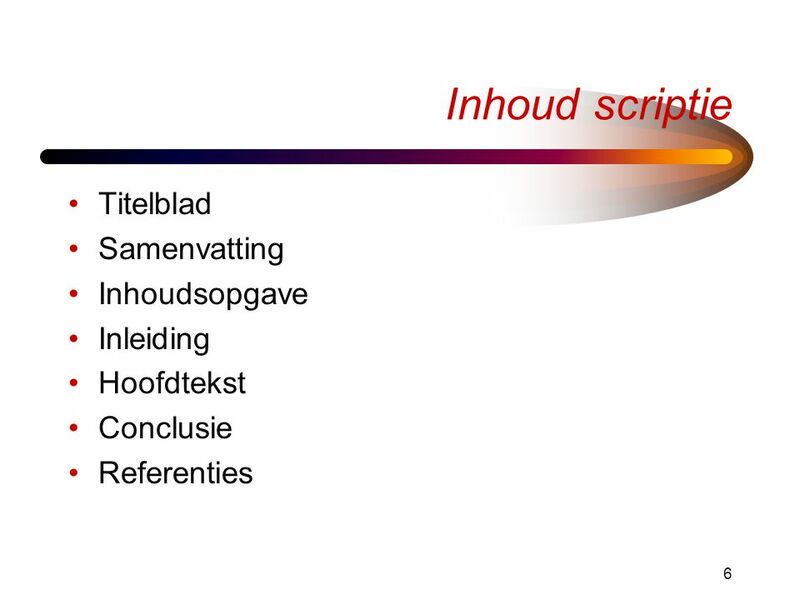 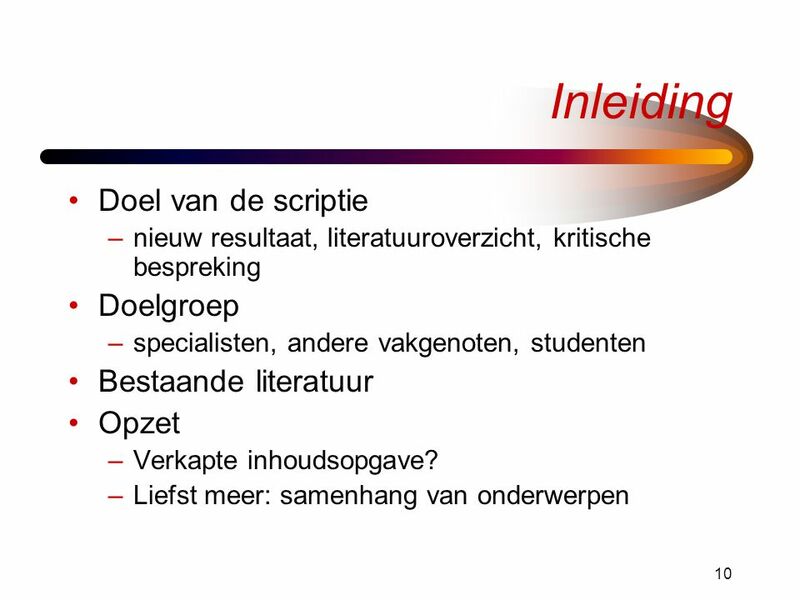 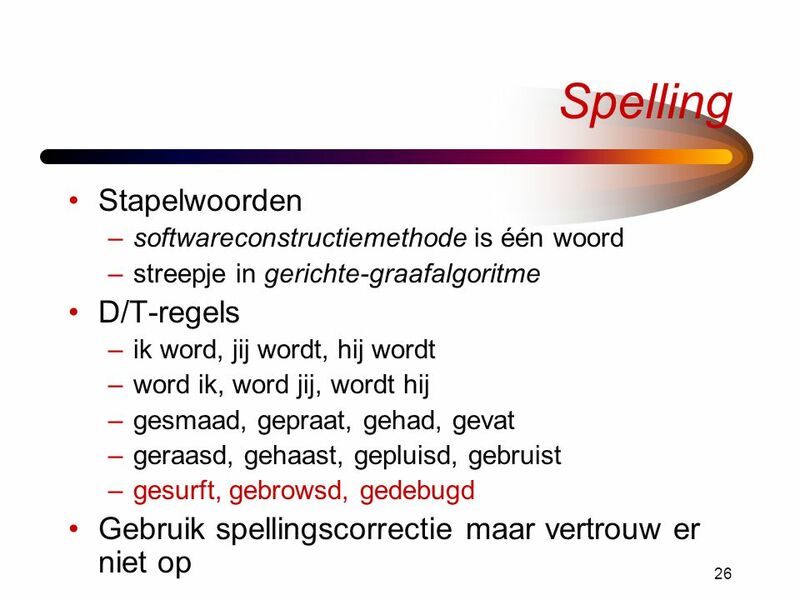 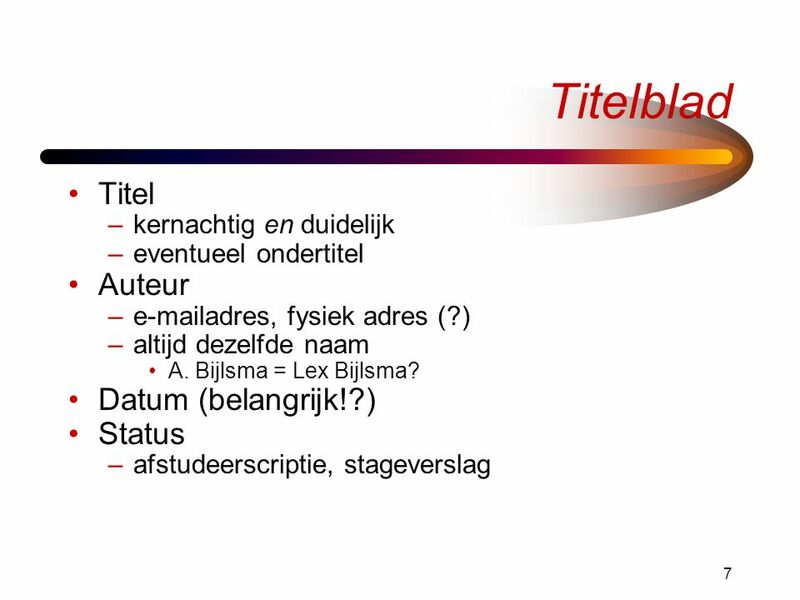 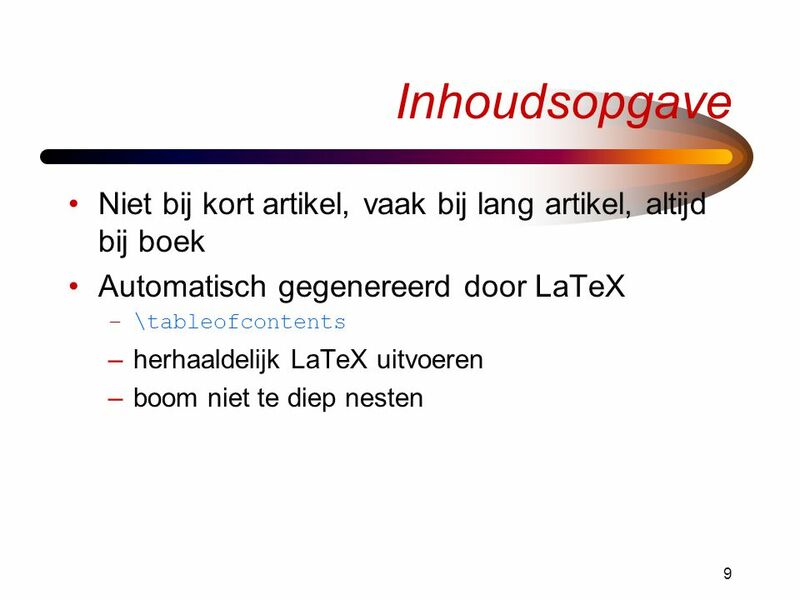 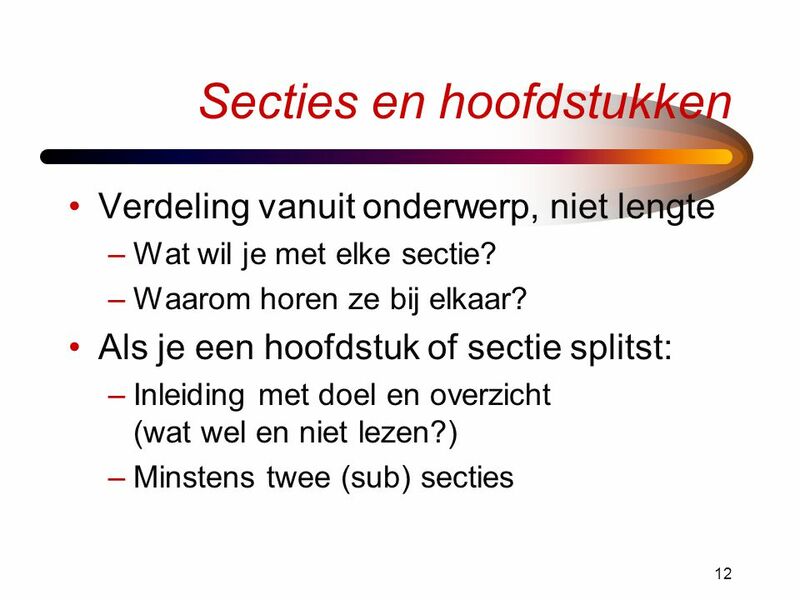 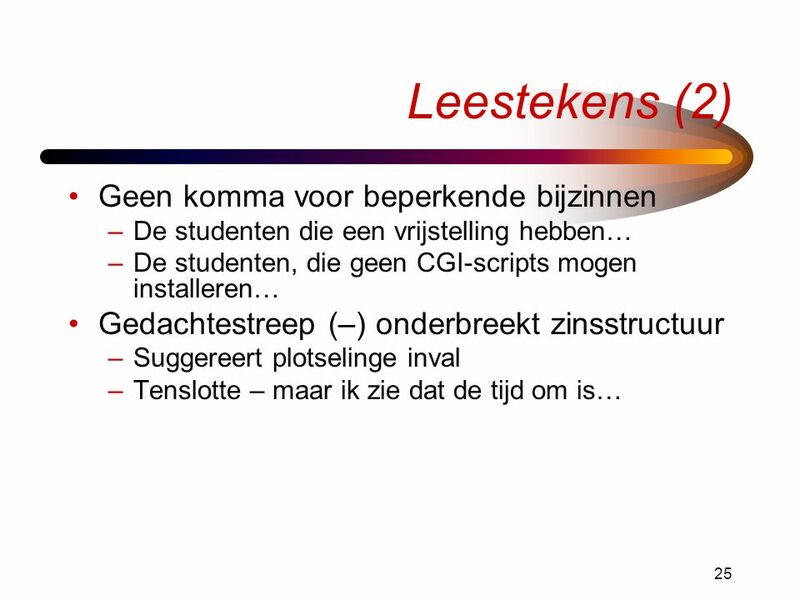 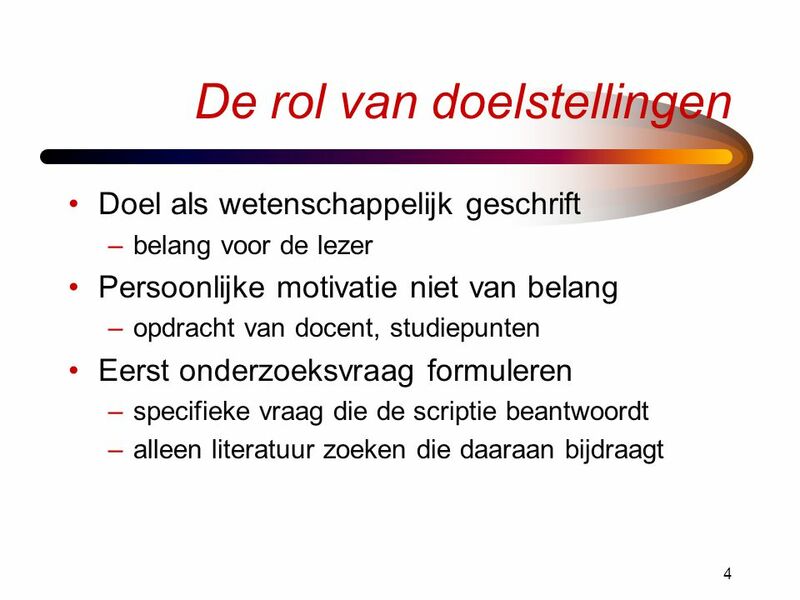 Download ppt "Het schrijven van een scriptie"
Compressie: het plan Overdragen 2009/2010 Groep 5. 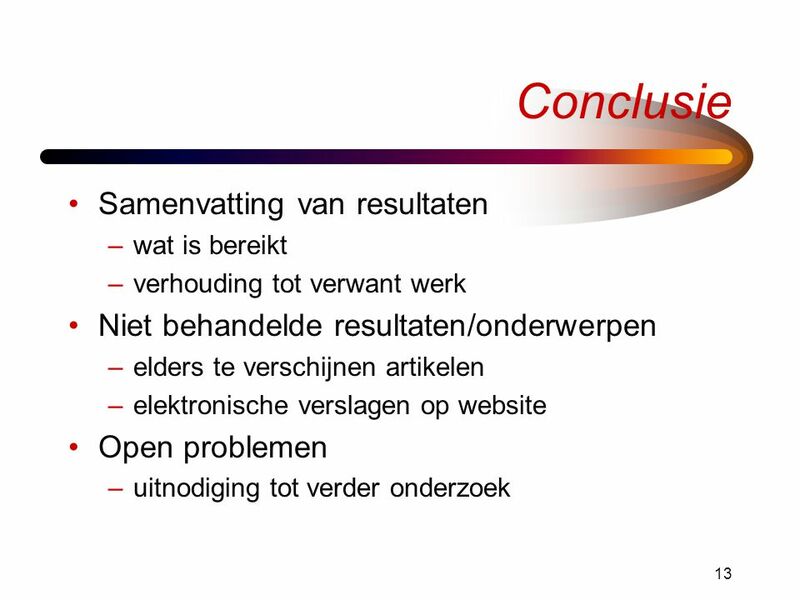 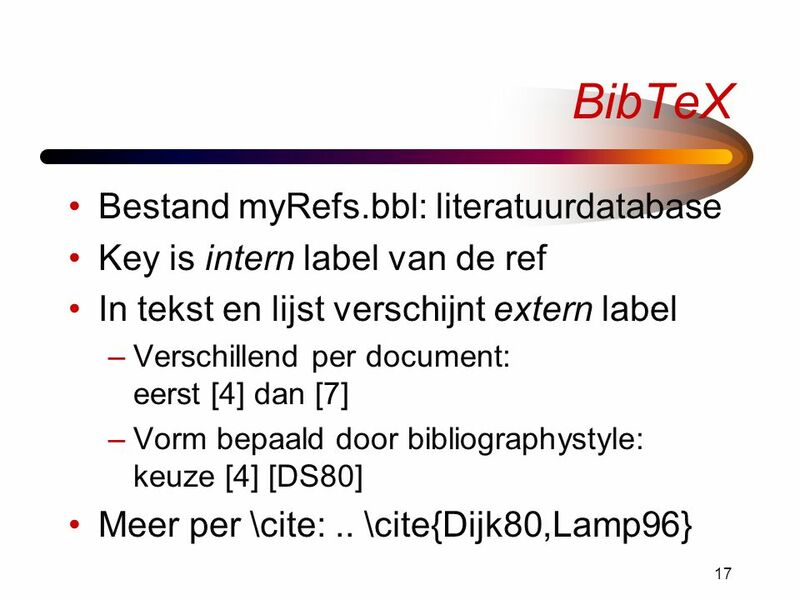 Overdragen van Informatica-onderzoek Gerard Tel Blok 4, 2007/8.